Dry or Wet and Dry Sandpaper? This type of question we get quite often from our customers. From our experience we know that it is hard to decide which type of sandpaper is needed. But this is only half of the problem. When type of sandpaper is chosen, the other problems are what grain and grits should be picked. To make it simple as possible we focus on types of paper sheets which are basically holders of abrasive grain bonded to a flexible substrate using adhesives. 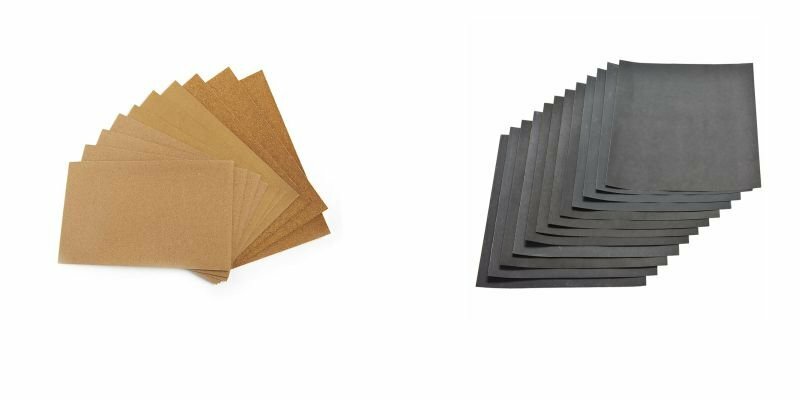 There are many weights and thicknesses of paper available for different products range as Sandpaper, Sanding Discs, Sanding Rolls, Sanding Belts, Sanding Block, etc. Dry backing paper can be categorised A-F, where A is designated for lightest weight and F for heaviest weight. For example, papers from A-C categories are normally used for manufacturing sanding sheets and hook & loop discs for light power sanding and hand sanding. On the other side papers D, E and F are mainly for power sanding where more resistant paper is needed and are not suitable for hand sanding, because of the thickness of paper. Especially sanding belts and discs are manufactured to use these types of backing papers. Aluminum Oxide (AO) – is made by combining bauxite with other materials by firing them in an electric furnace. The resultant mass is then crushed, and pieces are sifted through successively finer screens to assign a Grit size (CAMI grading). Aluminum Oxide is very tough and durable and is used on bare wood, most metals (as steels), leather and a wide variety of other materials. It is a most widely used general purpose grain today. Silicon Carbide (SC) – is made by mixing pure white silica sand and coke (side product of coal production). It is second after diamond in hardness. However, it is very brittle due to the narrow grain body. Therefore, when pressure is applied to the tip of this grain, it fractures. Commonly used in finishing types of jobs where the pressure required for working is lower than it would be in removing grits. Example of materials normally sanded with this grain include glass, plastic, rubber, paint varnish, lacquer & sealers. Alumina Zirconia (AZ)– combines the best characteristics of Aluminum Oxide and Silicon Carbide grains to create one very durable yet friable grain. This grain provides a consistently sharp edge on the workpiece and extends its life. Used mainly for high removal rates and time effectivity, examples as planing of wood, heavy grinding of metal and others. It is normally stick on heavier paper or cloth backings. It is more expensive to produce it. Ceramics (C) – Ceramic grain is manufactured by combining bauxite, just like regular Aluminum Oxide, with other materials in a chemical bonding process. It is used for rough grinding on metal. This grain is the most expensive to produce. Grit size is defined by numbers running from coarse 10 to fine as 7000. If we take a sample of Wet & Dry Sandpaper from German manufacturer Klingspor Abrasives then grits go from 60 to 2500, where low grits are used for heavy sanding and higher grits for finishing jobs. To choose correct grit, firstly you need to know type of specific job you are going for. If your job requires heavy sanding and stripping, then you would start with sandpaper measuring 40-80 grit. For smoothing surfaces and removing imperfections, choose grits from 100-220. Finally, for finishing surface smoothly, without visible marks, go for extra fine grits ranged 240-2500. Usually your job would require you to go through various grits, where you start with lower grits and finish with extra fine sheets of sandpaper. By doing this you would be able to remove scratches from previous layers sanded with lower and medium grits. Please see our Wet and Dry Sandpaper grit classification table for better understanding. This entry was posted in Blog and tagged Klingspor, Sandpaper, Wet and Dry.